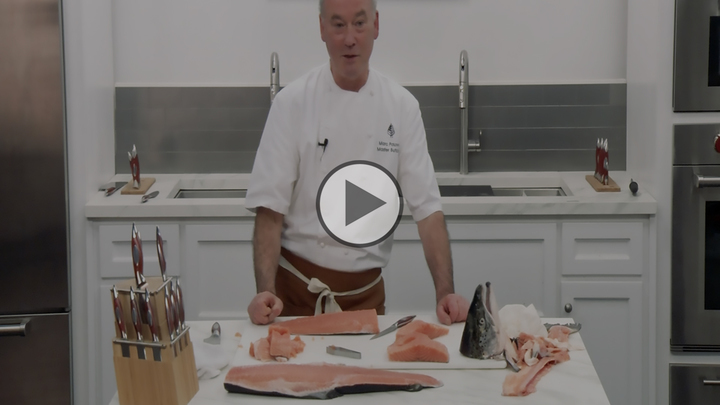 Master Butcher Marc Pauvert from 4 Seasons Baltimore introduces us to his worst enemy: fish scales. Scales are a butcher’s worst enemy because they cause blades to slip and ruin expensive fish. Marc starts close to the head, near the front fins, then cuts from the head down to the tail along the spine. He carefully separates meat from the ribs, then cleans his blade after every cut. He repeats the step with the other side of the fish, then removes belly fat-which can be used for fish tacos. All other points and portions should be even.